Objectives To provide the policy-relevant estimates of impacts of alternative flavour bans on preferences and demand for cigarettes and e-cigarettes in adult smokers and recent quitters. Methods A best–best discrete choice experiment (DCE) is used to elicit smokers’ and recent quitters’ preferences for flavours, price, health impact and nicotine level in cigarettes and e-cigarettes. Choice of tobacco products and an opt-out option were examined. An efficient design yielded 36 choice sets. Exploded logit choice models were estimated. Flavour bans are modelled by restricting flavour coefficients in the estimated model. Setting and participants A sample of 2031 adult smokers and recent quitters was recruited to complete an online survey and DCE. Results Current smokers and recent quitters, on average, prefer cigarettes and menthol cigarettes over flavoured e-cigarettes. However, there is substantial preference heterogeneity by younger adults (ages 18–25), race/ethnicity and respondents with higher education. Our predictions suggest that a ban on menthol cigarettes would produce the greatest reduction in the choice of cigarettes (−5.2%), but with an accompanying increase in e-cigarettes use (3.8%). In contrast, banning flavours in e-cigarettes, while allowing menthol in cigarettes would result in the greatest increase in the selection of cigarettes (8.3%), and a decline in the use of e-cigarettes (−11.1%). A ban on all flavours, but tobacco in both products would increase ‘opting-out’ the most (5.2%) but would also increase choice of cigarettes (2.7%) and decrease choice of e-cigarettes (−7.9%). Conclusions A ban on flavoured e-cigarettes alone would likely increase the choice of cigarettes in smokers, arguably the more harmful way of obtaining nicotine, whereas a ban on menthol cigarettes alone would likely be more effective in reducing the choice of cigarettes. A ban on all flavours in both products would likely reduce the smoking/vaping rates, but the use of cigarettes would be higher than in the status quo. Policy-makers should use these results to guide the choice of flavour bans in light of their stance on the potential health impacts both products. In this study, we provide the policy-relevant predictions of the impact of flavour bans on the choice of cigarettes and e-cigarettes. Specifically, we estimate the impact on product choices of a set flavour bans that could be implemented by the FDA. We use an online discrete choice experiment (DCE) on 2031 US smokers (ie, smoked at least 100 cigarettes in their lifetime) and recent quitters (ie, quit smoking in the last 12 months) ages 18–64; the sampling was matched to a national smoking survey. We estimate preferences for flavours in cigarettes and e-cigarettes while controlling for other attributes of both products, and study how these preferences vary with individual characteristics. We then predict the demand for cigarettes and e-cigarettes under alternative policies banning flavours and discuss which flavour policy bans would be optimal under alternative criteria for protecting public health. In contrast to most of the literature on flavour bans, we examine their impact on both cigarettes and e-cigarettes. That is, we focus on how product-specific flavours and their bans affect the complementarity and substitutability of choices across products. We also add to the tobacco literature that uses experimental approaches to examine substitutability across tobacco products.20 21 For example, previous studies used auction-based experiments online,22 in the field21 23 24 or in person,25 26 and purchasing tasks online.27 28 They find evidence of a significant substitutability as a function of price,28 as a function of the frequency of use of similar products22 and the level of nicotine.23 Several papers have used their online experimental tobacco marketplace to study substitutability22 29 and have found substitutability between cigarettes and e-cigarettes as price varies. In sum, our DCE approach allows us to predict the impact of alternative policies that are not currently in place and to focus on substitutability driven by flavour bans. In addition, our large, up to date, data set of current and former smokers, matched to a national survey, allows us to estimate the heterogeneity in impact of these bans across smoking status and individual characteristics. A DCE is a survey-based experimental approach aimed at eliciting individual preferences for goods and services.30 In a DCE, respondents make a series of choices across products described using a set of attributes and levels. The relative importance of each attribute and the value of alternative options can be derived from the choices, using choice models. The approach has been extensively applied in health policy and public health research,31 in tobacco research,32 and e-cigarettes.33–35 A strength of DCE is that it allows examination of the likely impact of alternative policies that are not currently in place. 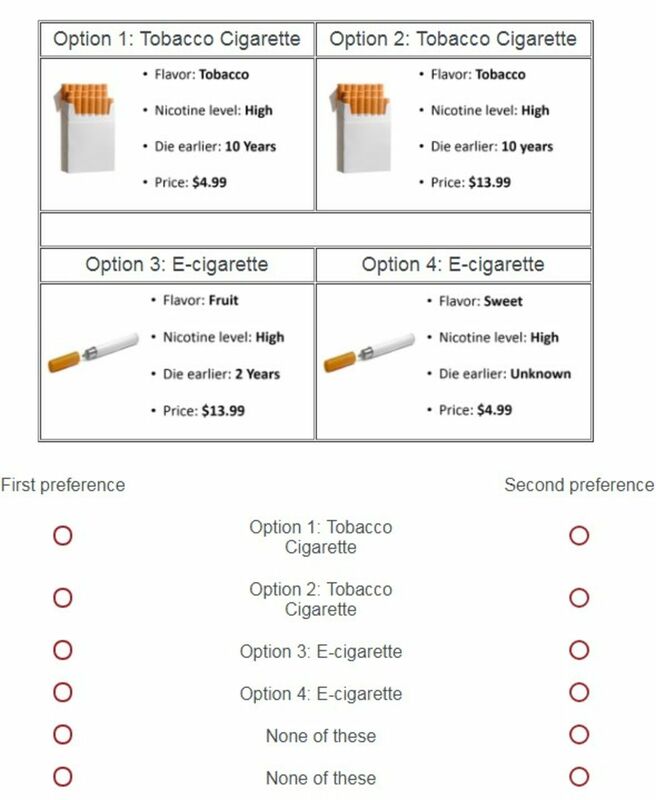 In this study, we aim to estimate the causal effect of flavours and other attributes on the choice of cigarettes and e-cigarettes, and then to predict the impact of flavoured cigarette ban alternatives.30 In this DCE, respondents choose their preferred option from a set of four products described by four attributes: flavour, health impact, amount of nicotine and price. See table 1, figure 1. In this best–best DCE,36 respondents were asked to respond to scenarios by choosing their two favourite options among cigarettes, e-cigarettes and ‘none of these’ (‘none’ hereafter). Note that the ‘none’ option appears two times to allow respondents to opt-out of both their first and second choice. Because the choice options are specific products, this is a ‘labelled’ experiment, which is beneficial for realism.37 We used a D-efficient survey design which generated 36 different choice sets.38 To reduce response burden, respondents were randomised to 1 of 3 blocks of 12 choices, each had different sets of scenarios seen in a different order. Kruskal-Wallis tests indicated the randomisation was applied correctly. The specific flavours were chosen to reflect currently available flavoured products in the USA: tobacco and menthol for cigarettes; and tobacco, menthol, fruit and sweet for e-cigarettes. The overwhelming majority of the many e-cigarette flavours can be classified as menthol, fruit or sweet.11 39 40 Note that tobacco is the underlying flavour for all cigarettes but must be added to e-cigarettes. In the paper, when we refer to flavours, we are referring to all but tobacco. Health risk was expressed as years of life lost by an average user. For cigarettes, this was 10 to reflect the known harm.41 For e-cigarettes, the four levels are: 2, 5, 10 and unknown; these reflected the likely lower health risk of e-cigarettes and the uncertainty surrounding true health effects.42 The levels of nicotine were low, medium and high for both products. A level of ‘none’ was provided for e-cigarettes as nicotine-free options are available. We did not use quantitative levels of nicotine (eg, in mg) as this was confusing to respondents. The qualitative levels used convey sufficient, ordered information. Finally, we defined price as the price paid for 20 cigarettes or the equivalent volume of e-cigarettes (using a conversion ratio of 1 disposable cigarette/1 e-cigarette refill to 30 cigarettes.43 We used this to make the prices of cigarettes realistic and the comparisons meaningful. Levels are based on market prices.44 The prices are displayed in table 1. Note the design accounts for the imbalance in the definition of attributes.45 A survey was administered to collect socioeconomic data and smoking behaviour information on each respondent. We took steps to increase the quality of the choice data collected. Prior to the DCE, detailed narrative and visual information describing the products (cigarettes or e-cigarettes) and their features were provided (see online supplementary appendix D for details). A sample experiment task was provided giving respondents practice in responding. We also used ‘forced responses’ to prevent respondents from skipping through the survey. And we used a minimum time threshold to remove respondents who rushed through. Finally, we used attention filters embedded in the survey to check that respondents were paying attention (eg, ‘select option 2 to show that you are paying attention’). We recruited a sample of 2031 adult smokers and recent quitters online using the survey firm Qualtrics. To be eligible, current smokers and recent quitters had to have smoked at least 100 cigarettes in their lifetime and had to be US residents between ages 18 and 64. Our sample size is large relative to other choice experiments in health, and it is in excess of minimum sample size calculations.46 Respondents were matched to proportions of smokers in regional/demographic quotas using data from the 2014 Behavioral Risk Factor Surveillance System based on six regions, gender and age bands. Details are provided in online supplementary appendix A. We used exploded multinomial logit (MNL) models to analyse respondents’ choices. Each of the 2031 individuals made 2 choices in 12 choice scenarios. Thus, there were 48 744 choices from 24 372 observations. We specified our initial model to be a function of product-specific terms and attributes. To align our model with the FDA’s policy options, we impose two features on the model. First, we combined fruit and sweet flavours into a single group as they are commonly considered jointly.34 35 Second, by interacting the ‘product constant terms’ with each of the flavours we were able to examine the product–flavour pairings directly. We referred to these combinations as ‘flavoured product constant terms’. Use of both of these improved the fit of the model. We are primarily interested in the estimates of the flavoured product constant terms: menthol cigarette, tobacco e-cigarette, menthol e-cigarette and fruit/sweet e-cigarette. Each of these constants represents the preference for each flavoured product relative to a tobacco cigarette (the reference case) at the sample level. See online supplementary appendix B for the model specification. We then interacted these flavoured product constant terms with sociodemographic variables that were collected in the survey. This allowed us to estimate heterogeneity by smoking status and socioeconomic and demographic characteristics, which increases the realism of our predictions. Attributes were dummy coded with the exception of price which was treated as a continuous variable. We believe that dummy coding is a better approach compared with effects coding as the interpretation of the reference category is clearer.47 We used the resulting model to make the predictions of the impacts of the set of policies. All analyses were conducted using Nlogit (V.6.0). The estimated choice models were used to predict what percentage of the sample chose each product type and the option of none. Using the estimated utilities from the choice model, we estimated the probability that each product would be chosen by each individual in each choice scenario.48 These are called choice probabilities and they sum to 1 across all options, in each choice scenario. The sample-average choice probability for each product is the model’s prediction of how many individuals will choose that product. These are called choice shares which are estimated using our models. When making our predictions, we model regulation alternatives by restricting flavours and recalculating the choice shares. The differences between the base and the revised choice shares across policy options are the model’s prediction of the FDA policies. We first predicted choices under the status quo and then imposed the set of policy scenarios (table 2) to predict the smoking choices under the alternative bans. Alternative 1 reflects a comprehensive ban on all flavours. Alternative 2 reflects a policy where only menthol would be allowed for both products. The other scenarios reflect a ban on menthol cigarettes only (alternative 3), often considered as a policy option; a ban on menthol in both cigarettes and e-cigarettes (alternative 4) as is the case in Canada and a flavour ban specific to e-cigarettes with a status quo for cigarettes (alternative 5). For instance, to analyse a ban on all e-cigarette flavours but not on tobacco (‘alternative 5’ in table 2), we set the coefficients on flavours in e-cigarettes to 0 and use the estimated model to obtain revised choice probabilities, which yield shifts in choices. These shifts reveal the potential impact of each policy. Table 3 shows the results from the choice models. Panel A displays the coefficients for flavoured products and ‘none’ as well as for the attribute levels: price, nicotine and health. The flavoured product coefficients are measures of the preferences for the product–flavour pairs relative to the omitted tobacco cigarette. On average, cigarettes are preferred to e-cigarettes, that is, all the e-cigarette constant terms are negative and significant. And, menthol cigarettes are preferred to the three flavoured e-cigarettes. Also, adult smokers prefer, from most to least: tobacco, fruit/sweet and menthol e-cigarette flavours. Findings also indicate that adult smokers prefer: lower prices, healthier outcomes, (relative to 10 years of life lost, the reference category) and a medium level of nicotine (which is the reference category). Panel B presents the full set of interaction terms. As above, the reference category is a tobacco cigarette. There is substantial preference heterogeneity across individuals’ characteristics. Specifically, younger adult smokers prefer menthol cigarettes and all flavoured (including tobacco) e-cigarettes. Older adult smokers prefer tobacco cigarettes. African-Americans, those with higher education, and those who report low health prefer menthol cigarettes. Those with higher education also prefer e-cigarettes of all flavours. There is further heterogeneity in preferences by smoking status. Those with one or more quit attempts in the past year prefer e-cigarettes of all flavours. Unsurprisingly, both dual users and vapers (those using only e-cigarettes) show very strong preferences for all e-cigarettes. Further, vapers prefer e-cigarettes to cigarettes. Specifically, the coefficient for the interactions of vaper and tobacco e-cigarette is positive and greater in absolute magnitude than the negative constant term for tobacco e-cigarettes. Thus, all else equal, vapers prefer tobacco e-cigarettes to tobacco cigarettes (though insignificantly). Also, vapers prefer fruit/sweet e-cigarettes to tobacco cigarettes, but not to menthol e-cigarettes. Last, recent quitters have a strong aversion to menthol cigarettes. A number of formal tests are applied to assess the sensitivity of the results. Broadly, these include: tests of the model structure by comparing the reported estimates to those obtained from a mixed logit (that relaxes the independence of irrelevant alternative assumption48 of the MNL); tests of the utility function specification and validity checks. In all cases, test results support the findings in the tables. As an informal validity test, we note that our findings are similar to those in the literature: young adults prefer non-tobacco flavours34–36 49–52 and older adults prefer tobacco flavour19 36 39; African-Americans’ prefer menthol52–54; those with higher education prefer e-cigarettes49 51 and quit attempters and dual users prefer e-cigarettes.44 55–57 Details are presented in online supplementary appendix C.
Table 4 displays the predicted choice shares across the set of flavour bans for sample averages. Each panel displays the following: Panel A repeats the description of the set of bans from table 2; Panel B provides the predictions of the impact of bans on choice shares and Panel C provides the percentage changes in the choice shares comparing the current policy to each of the alternative bans (calculated from Panel B). Each row relates to one of the potential policies described. As seen in the first row of Panel B of table 4, the predicted choice shares under the set of current flavour bans are: 45.2% for cigarettes, 37.5% for e-cigarettes and 17.2% for ‘none.’ This compares to 51% of cigarettes-only users, 31% of dual users and 7% of e-cigarettes-only users in our sample (see online supplementary appendix A), suggesting that a portion of the predicted share of e-cigarettes reflects dual users’ preferences. Results show that policy-makers seeking to minimise the use of cigarettes should ban only menthol in cigarettes (policy alternative 3). This results in the lowest choice of cigarettes which, at 40.0%, represents a 5.2% reduction in the percentage of cigarette choices (Panel C). Of this reduction, the majority goes to e-cigarettes at 3.8%, with the remaining going to ‘none’ at 1.6%. Under alternative 1, the use of both products is minimised leading to the highest choice of ‘none’ at 22.4%. In this case, e-cigarette choice declines by 7.9% and instead, people increase their choice of cigarettes by 2.7% and ‘none’ by 5.2%. See in Panel C.
Importantly, a ban on all e-cigarette flavours but tobacco is an inferior option for either of the above goals, as alternative 5 indicates. Although this comprehensive ban would result in the largest reduction in selecting either product, selection of cigarettes would increase from 45.2% to 53.5%. Unfortunately, 8.3% would change from e-cigarettes to cigarettes and only around 3.0% would change from e-cigarette to ‘none.’ Thus, this policy would likely drive current e-cigarette users towards vaping or smoking more than towards abstinence. However, as above, part of the change from e-cigarettes to cigarettes might be more people becoming dual users instead of an increase in cigarettes-only use. A key strength of this study is that it makes needed, policy-relevant, predictions about a set of potential flavour bans. We are the only study that we know of that examines alternative bans in the USA in both cigarettes and e-cigarettes and the impact of these on the choice of both products and opting-out (‘none’). Further, we use the DCE approach which is one of the few approaches that allows for rigorous and quantitative examination of the set of counterfactual flavour ban policies in advance of setting such policies. Also, we collected a large, and national data set of current and former adult smokers which was matched to a national survey. Our models allow for rich heterogeneity in preferences which adds precision to our predictions. In addition, we have conducted our experiment in line with best practices60 and have applied a broad range of robustness checks and sensitivity analyses that support our findings. Combining these, we are thus able to make realistic quantitative estimates of the impact of alternative flavours bans across both cigarettes and e-cigarettes for the USA. Despite the above strengths, our study has several limitations. First, there is a risk of hypothetical bias in all DCEs,61 but we help address this by analysing current and recent smokers who frequently make such real-world decisions.62 63 Other studies have shown comparability between experimental and real-world behaviours for tobacco.64 65 Second, the meaning of the ‘none’ option is somewhat ambiguous. While it may reflect a willingness to quit smoking in a given scenario, it may also reflect that the respondent would not choose any of the given options but might use other products. Third, the study does not examine the use of other tobacco products, such as pipe tobacco or hookah. Fourth, we do not observe whether smokers alter their consumption quantity depending on the product selected; for example, in changing to e-cigarettes, smokers may decide to smoke more or less heavily. Fifth, we use generic products instead of brands in the choice sets. The use of brands might have made the tasks more realistic, although using a specific brand can in itself introduce bias. Sixth, our efficient design mitigated attribute imbalance, but did not necessarily fully balance the attributes because of restrictions we imposed; we prioritised the realism of the choice scenarios over the balance of the design to uphold the quality of the data. Last, youth smoking decisions should be examined separately, but is beyond the scope of this study. However, with 36.5 million adult smokers in the USA, our results are critical for informing policy. Our results have important policy implications for selection of flavour bans in the USA. We conclude that flavour bans can be effective levers to affect smokers’ choices. Alternative flavour bans can either enhance the protection of the health of the public or worsen it, by driving smokers to alternative products or to obtaining.68–70 These results have some perhaps surprising implications that could prove valuable to lawmakers and regulators in crafting the best policies for public health. Menthol cigarettes are appealing to some smokers; and flavours are a key aspect of the appeal of e-cigarettes. Banning menthol in cigarettes is likely to reduce smoking rates. Banning characterizsing flavours in cigarettes has reduced adolescent smoking; banning characteriszing flavours in e-cigarettes has limited impact on adult smokers’ cigarette and e-cigarette choices. Almost 40% of smokers are dual or poly users. Evidence suggests smokers may substitute between tobacco products following relative price changes. However, with one exception, the substitutability between product types following alternative flavour bans has not been investigated in the literature. We study preferences of current adult smokers and recent quitters for flavours in cigarettes and e-cigarettes and make predictions on the use of both products for a range of alternative flavour bans. Our results indicate possible substitution between cigarettes and e-cigarettes as flavour availability varies. Our findings suggest that banning menthol in cigarettes while allowing flavours in e-cigarettes is likely to produce the greatest reduction in cigarettes smoking. However, banning flavours in both product types is likely to have the greatest reduction on overall use of cigarettes and e-cigarettes. design of the experiment. We thank Kurt Petschke, Yale School of Public Health, for his additional assistance. Food and Drug Administration. FDA announces comprehensive regulatory plan to shift trajectory of tobacco-related disease, death. Maryland, USA: Food and Drug Administration, 2017. Royal College of Physicians. Nicotine without smoke: tobacco harm reduction. London: Royal College of Physicians, 2016. NHS Health Scotland. Consensus statement on e-cigarettes. Edinburgh: NHS Health Scotland, 2017.
. Mostly harmless regulation? Electronic cigarettes, public policy and consumer welfare. Cambridge, MA: National Bureau of Economic Research, 2017.
. The behavioral economics of tobacco products. In: Hanoch Y , Barnes A , Rice T , eds. Behavioral economics and healthy behaviors: key concepts and current research. New York: Routledge, 2018.
. The value of countermarketing information to smokers: evidence from field auctions. Journal of Agricultural and Applied Economics 2011;43:607–20.
. Stated choice methods and applications. New York: Cambridge University Press, 2000.
. Applied choice analysis. Second edn. Cambridge: Cambridge University Press, 2015.
. To ‘Vape’ or Smoke? A discrete choice experiment among U.S. adult smokers. National Bureau of Economic Research Working Paper Series 2016:No. 22079.
. Experimental design and choice experiments. In: Hensher D , Greene W , Rose JM , eds. Applied choice analysis. Cambridge: Cambridge University Press, 2015.
. Discrete choice methods with simulation. Cambridge: Cambridge University Press, 2009. Office of the Surgeon General. Preventing tobacco use among youth and young adults: a report of the surgeon general. Washington, DC: US Department of Health and Human Services, 2012. Tobacco Products Scientific Advisory Committee (TPSAC). Menthol cigarettes and public health: review of the scientific evidence and recommendations. Rockville, MD: Food and Drug Administration, 2011.
. Real choices and hypothetical choices. In: Hess S , Daly A , eds. Handbook of Choice Modelling. Cheltenham: Edwards Elgar Publishing, 2014.
. The new science of pleasure: consumer choice behavior and the measurement of well-being. In: Hess S , Daly A , eds. Handbook of choice modelling. Cheltenham: Edward Elgar, 2014.
. Stated preference methods and their applicability to environmental use and non-use valuations. In: McFadden D , Train K , eds. Contingent valuation of environmental goods: a comprehensive critique. Cheltenham: Edward Elgar, 2017. Public Health Law Center. U.S. sales restrictions on flavored tobacco products (2017). St Paul, USA: Public Health Law Center, 2017. Public Health Law Center. How other countries regulate flavored tobacco products (2015). St Paul, USA: Public Health Law Center, 2015. National Academies of Sciences, Engineering, and Medicine. Public health consequences of e-cigarettes. Washington, DC: The National Academies Press, 2018. Contributors JB: conducted the analyses, contributed to the drafting of the manuscript. JM and JLS: contributed to the drafting of the manuscript, advised on the data analyses. All authors: designed the survey, designed the experiment, interpreted the findings, reviewed and approved the final version of the manuscript. Funding Research reported in this publication was supported by grant number P50DA036151 from the National Institute on Drug Abuse (NIDA) and FDA Center for Tobacco Products (CTP). Disclaimer The content is solely the responsibility of the author(s) and does not necessarily represent the official views of the National Institutes of Health or the Food and Drug Administration. Ethics approval Yale University Human Subjects Committee.